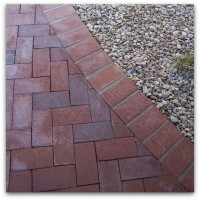 A lot of people enjoy brick on their sidewalks, patios and even inside the Home as well. Although we certainly dont add brick to every home Home that we build, we do use a fair amount of it. Brick is an excellent material, comes in a wide variety of colors and styles and is extremely durable, used both inside and out. The most important thing to remember when using brick is to properly account for it in the planning stages of the Project. Due to the thickness of the material, the concrete elevation needs to be adjusted accordingly so that you dont have a finished Product where the elevation of the brick is higher than the elevation of the surrounding flooring materials, or that issues arise with the elevations at door threshold areas.